It’s probably worth saying this once more. These images are merely indicative. 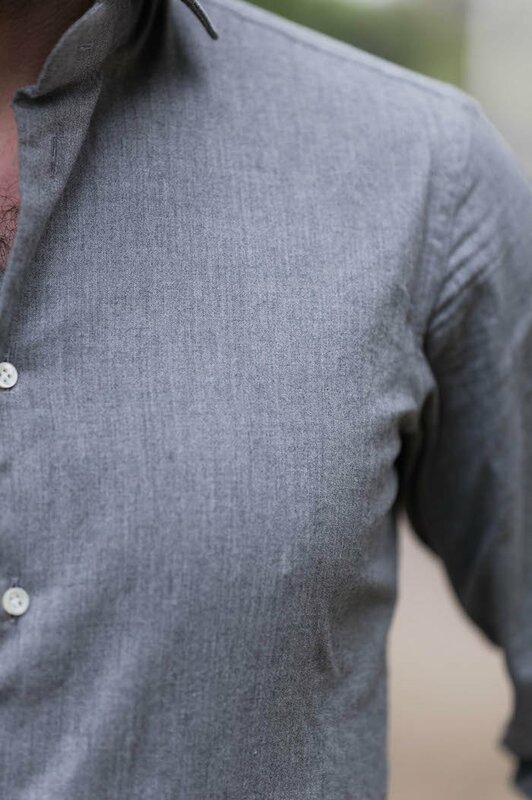 They are intended to give a general impression of the shirt (a lovely grey from Simone Abbarchi). They are not intended to be the basis of an assessment of the fit. There. Got that off my chest. So, how did my first commission from Florentine shirtmaker Simone Abbarchi turn out? Not bad, overall. Probably a worse fit on the body than most other makers I have tried, but only just and the collar is spot on. I’ve said before that the collar is the most important part of the shirt, and it’s true. It’s particularly important for men that wear jackets a lot, but even for those that don’t, the body of a shirt is never going to flatter you like a tailored jacket. If you aim for that, you’ll have the shirt cut too tight, and you’ll start popping the buttons when you sit down. Look to the collar first. The fit through the waist can also be nice. The sleeve length should be bang on. And it’s nice when the slope of the shoulders is correct, so that the chest of the shirt is relatively clean. The places where Simone’s fit let it down are across the shoulders, and through the waist. The former are too tight, particularly after washing, and the waist is a chunk too big. The shoulder isn’t uncomfortable, and the waist isn’t bad, but neither are as good as you should expect from bespoke (or made-to-measure for that matter). Simone does both – bespoke and MTM – but with no handwork at all in the making. This makes him quite cheap, starting at €150 for bespoke and €120 for MTM. And despite that lack of handwork, the finishing was good – indeed, the initials I have just above the hem at the front were probably finer than any other maker. I had some adjustments made to the pattern in Florence, and should have a new shirt in a couple of weeks. If I had paid £200 for the shirt, I might have been a little disappointed with the fit. But at £100 it’s OK, only because it’s worth working a little more to get a good pattern that can be used for subsequent £100 orders. That will be good value. You can follow the discussion on Simone Abbarchi – finished bespoke shirt by entering your email address in the box below. You will then receive an email every time a new comment is added. These will also contain a link to a page where you can stop the alerts, and remove all of your related data from the site. I’m certain you must mean 150 for bespoke and 120 for MTM, not the other way around? I think I definitely prefer L.A. shirts albeit more pricey. Simon – you have done it again and not revealed the complete outfit you are wearing! In this case the coat which incidentally looks fabulous. I really like the combination and textures all set off by the simple white hankerchief. Question: Not having the income to spend on bespoke shirts (regardless of the cost) can i ask if there is a trick that one can adopt when ironing a shirt which is to be worn with no tie and no coat that will keep the collar upright and not splayed out which looks horrid? All my attempts have failed (starch, iron flat, iron folded etc.) I have even been thinking about designing a system whereby i get a tailor to make little tabs with button loops under the collar so that when fastened the collar stands up yet cannot be seen. Then when wearing a tie the system is simply not used. Fiddly i know but i cannot see any way round this other than using a button down collar which is not want i want. What do you think? Hay Bradley a trick that works for me is to iron/press collars from the back (ie. the underside as you wear it) and flat, never iron it folded! If you are hanging your shirts do so with the top button done up. This way my collars stand up to attention with or without the aid of a neck tie. The best solution will always be to have collars cut (or rather the collar band cut) to an appropriate shape. Most often, the key is that the shape of the band kicks up at the front of the neck, and is slightly wider at the sides to sit on the hollow of the collar bone. I really like that cloth. I am looking at something in a similar style of cloth, in blue but in a button down to be worn with knitwear and casual jackets. Is this fabric in one of the standard bunches? i actually have already emailed Simone about an appointment already so thanks for the recommendation. at that cost its far cheaper an much more practical than buying RTW shirts from 30-100 and having them altered. Hi Simon, to me the fit looks pretty good for the price and in a lovely fabric too. Given that it fits well in the most important places as you say, could you not simply put some shallow darts in or bring the sides in a touch to correct the fit issue around the waist? You could certainly deal with the waist that way, yes. Not much you can do about the shoulders being too narrow though. Would I be correct in assuming that Simone cuts his shirts trimmer than Luca Avitabile? Shirts with ill-fitting shoulders were a bugbear of mine for a number of years, and the ability to get this right is the main reason why I now use Burgos almost exclusively. Three different UK shirtmakers had failed to come up with the clean line that I wanted – each slightly different, and each unsatisfactory in its own way. Carmen and her colleagues got their assessment right (I believe a “four” and a “five” under whatever measuring system they use) at our first meeting, and things have remained wonderfully consistent since: from the first to twentieth shirts. Burgos’ hand finishing may be something of an extravagance (though it is one that brings me pleasure each time I iron my shirts). However, I think quality of fit is an essential feature (to my mind being the key benefit of bespoke) and it is this that has kept me a loyal and happy customer. Iain, I too am a very satisfied customer of Burgos’ – great customer service and value for money (especially with current EUR exchange rates.) My only complaint is that, despite multiple valiant efforts, they cannot seem to get the Italian style “roll” on button down shirts. I even met with their head cutter in Madrid and showed him an example but they always seem to end up looking rather flat. I’ve tried contacting all the Neopolitan makers covered in this blog (including Abbarchi) but can’t seem to persuade any of them to visit NYC. As it is, I currently use Thom Sweeney, who outsource their shirt making to an Italian company. It seems a rather round about way of doing things (and they take forever) but the collars are absolutely exquisite and have the perfect roll. BespokeNYC Simone abbarchi comes to NYC in sept/October and March/April every year. Luca avitabile is coming in September. I already made an appointment with luca and am waiting for Simone to send his email out to his New York clients about the fall visit. I am at a loss to think why you would buy a bespoke shirt and then consider it acceptable to have to start putting in darts to sort out quite important fit issues! Back to the tailor for mine. I feel the same, HAK. I’m newish to the site (though not the concept of style in general, I hope), and while I could afford – at a stretch – to buy most of the items Simon commissions I’d like to think that bespoke means that everything is perfect from day one, as the price point seems to promise. I understand that SA shirts aren’t quite at the top end of bespoke shirting price wise, but it does put me off a little that the fit wouldn’t be spot on, especially as I live in a remote part of the world in which MTM would be my only practical option. The thought of spending X x the price of RTW for something that doesn’t fit perfectly worries me, especially when you consider the time it takes to produce the finished product. All that said, the collar is fantastic, especially so with the jacket curling it in a little, and I’d kill for a length of that cloth out here in the sticks. Fit be damned. One point Keith – for that price, in London at least, you’d be buying a top-end RTW shirt, let alone MTM. Bespoke, however, is never perfect. RTW always will be, it’s made to be. Bespoke is a project, a starting from scratch. It will be very good, it will indeed be better without being perfect. But it won’t be perfect. At this price point, you might want to try Vergallo. Fit for me was very good. However, the finish was not the best. I tried Vergallo because of your website. I’m having a few things made by him. What did you think of his shirts? Excellent material and colour, I notice you are using grey in your shirts and ties more often and I think it’s a vastly underused and versatile colour for such garments, particularly in chambrays, wools and flannels. 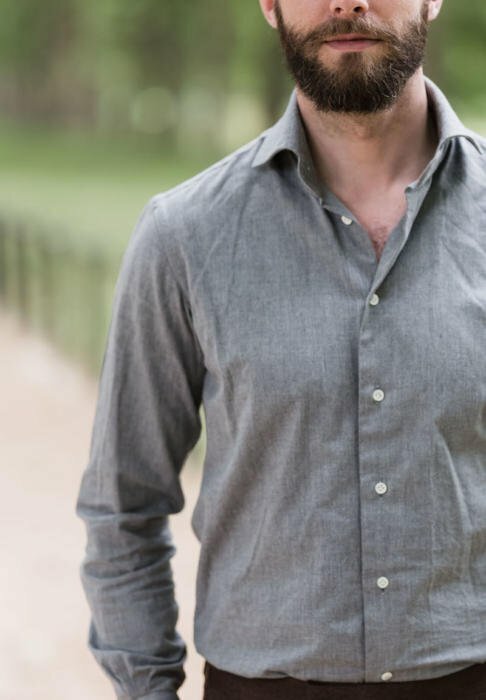 I note that generally your collar styles are similar between shirts, how would you describe the collar style and do all your shirts work with and without ties or do you have different collars styles for each purpose? 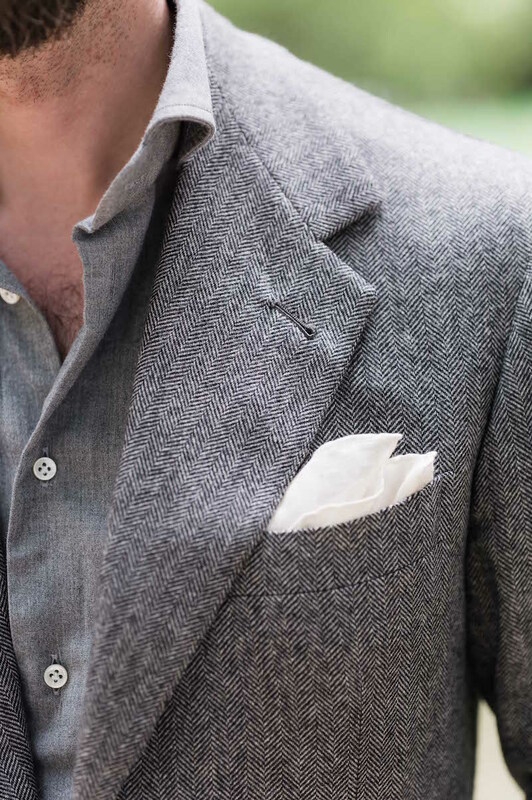 What kind of fold are you using for your pocket square in the last photo? I’ve also decided to have a go at Simone’s shirts. Looking forward to meeting him this September. This post is very interesting even for those who can’t afford bespoke shirts. 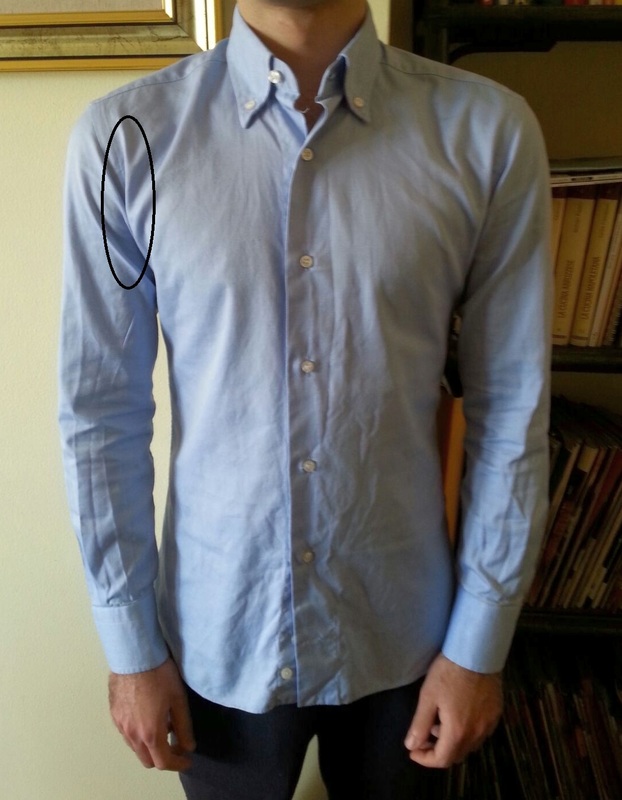 As to the make, key features of a shirt to pay attention on: collar and shoulders. Looks OK. I owe you a birra for flagging up Luca A, btw. He’s tops. I have come back to this post because over the next year I am going to be starting my first ever bespoke commissions (straight from RTW not MTM in between) i am commissioning a suit and some shirts. I think I know enough for my suit consultations having met tailors, had initial consultation etc (and read the blog) But what about shirts? I have appointments with Simone and Luca, to see if the £60 difference is worth it for me long term. I am planning on two simple blue shirts and Oxford type button down and a nice, slightly more formal poplin with cutaway. But what other tips would you give for my first bespoke shirts and what to expect at an initial consultation / commission. It may seem simple compared to a suit but when a shirt maker (or even tailor) is a travelling one you simply cannot just nip in for a chat. I wouldn’t say either would be better for a style, no. If you mean the width of the shoulder, generally the seam where the shoulder meets the sleeve should sit on the point of your shoulder bone. I quite literally read your blog everyday and wanted to ask if there was anyone in particular you go through for shirting fabric? Thomas Mason? Albini? Alumo? Do you prefer having shirts cut from 120/2 or 140/2 or does it not make any difference to you? 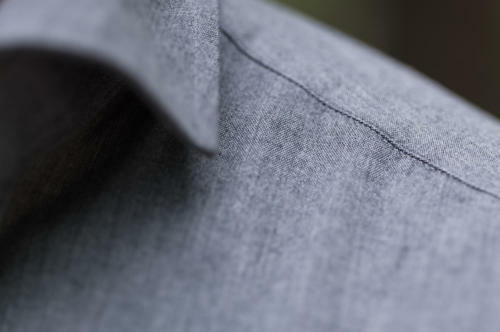 On your every-day shirts, do you prefer twill to broadcloth/ poplin? Do these folds on the sides of the chest mean the shirt is too big in the chest? Or should they be there to allow more freedom of movement? I noticed you wear one of those cool one-piece collars. I tried to replicate it but the result wasn’t very good. Would you mind sharing some insights about the construction of the collar (fused/unfused, how much lining etc.)? Simone is coming to London next week and I’m contemplating having my first bespoke shirt made. are there many other options in this price point ? I’ve heard vergallo mentioned a few times. I visited Florence a couple of months after this post and had a shirt made by SA (a paper/cotton sample shirt based on my pattern was ready in store 24 hours after my first visit – very impressive, so definitely something that can be done during a 48 hour visit to the city, with the shirt sent by DHL a number of weeks later). I also followed up when they visited London the following February and placed an order for some 5 or 6 shirts. First things first, Simone and Gianluca were true gentlemen and a pleasure to deal with at every stage. A good choice of clothes and I was generally happy with the fit. My only hesitation is that the shirts are cut very short at the bottom, to the extent that there is not enough material to tuck them into suit trousers (or if there is, they come loose within a few minutes). I’d like to think this is something that could be easily fixed in subsequent orders, but it worth bearing in mind for any first timers. Hi Simon. I have an necktie from Finollo (Genoa), whose color is ecru with medium size medallions. I bought it because I liked it very much. Unfortunately, it has been sitting in my closet for almost twenty years since I have not found the right shirt color (and also weave and fineness), not to mention the jacket or suit fabric and color. Do you have suggestion? Thank you. Thank you Simon. After I sent the message I thought about how hard it would be to say without seeing it. However I will work around the combinations that you just suggested.